This book, which goes further than any other in explaining the political moment, will be a standard reference work for years to come. The Mises Institute is the exclusive distributor of this paperback edition at this special low price! If you want to understand the underlying political dynamic alive in the United States, you must read and comprehend this hugely important work. The drive for liberty, whether from the left or right, is the underlying impulse. This book tells you where it is all headed and why. It might seem easy to write an overview of libertarianism. If so, why do so many attempts fall short? They typically leave out something important, like foreign policy, drugs, or intellectual property, or the attempts are biased this way or that. 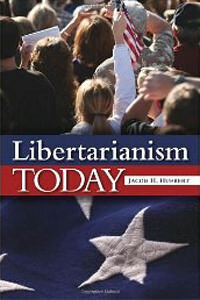 At last, Libertarianism Today by Jacob H. Huebert has succeeded. It is comprehensive. It is truthful. It is realistic. It is analytically rigorous. It combines theory with policy with a great story about what is going on in the world today and how libertarianism addresses these problems. The result is a fantastic successor book to Murray Rothbard’s classic For A New Liberty (1973). In 250 pages, Huebert tells you what you need to know. He shows that libertarianism is spreading in academia, in the culture, in the media, and in politics. Indeed, it has become the most potent resistance movement of our time. He also offers a compelling defense of libertarian doctrine as well, so that someone who has never heard these ideas can be persuaded. Here, finally, is a book that covers all the major issues, and from a solidly Austrian and anarchist-informed based–one that does not reveal (or feign) ignorance of various libertarian perspectives on issues such as democracy and decentralization and drawbacks of use of electoral politics or court battles. I’ve long maintained that an appreciation of Austrian economics is essential to sound libertarian theorizing; without it, there is always something missing it; with it, a more integrated and coherent libertarian perspective is possible. Huebert’s book exemplifies this in spades. Let me also say, as somewhat of a specialist on IP related matters, that Huebert’s chapter on this topic is probably the single-best concise overview and explanation of the proper Austrian-libertarian case against IP, and the related libertarian debates about this matter, that I’ve ever read. The book is great for the intelligent person looking to learn more, but has enough insights to interest even seasoned libertarian intellectuals. This is one of the first books I can imagine giving to intelligent almost-libertarian friends, who have some interest in our ideas. The book is punchy and well written, not boring; but it doesn’t talk down to the reader either. It’s got exactly the right tone, and covers all the major, modern libertarian issues, fairly and objectively. It’s going to be very useful and popular among seasoned libertarians, the growing young generation of emerging libertarians, as well as potentially interested people among the civil libertarian left and among the anti-bailout right/Tea Party types. I highly, highly recommend this wonderful book. This is the perfect jumping off point for anyone that is interested in further study into the non-aggression principle, and its application towards paramount issues. Really enjoyed this book, I am a Canadian and even though this book certainly concentrates on the US I still found it very interesting and informative. Also it was very well written and full of great references to other readings. Great intro book to modern libertarianism. Trying to convert a misguided conservative? This is the book to use! The cover is regrettable, yet it saddens me even more that Huebert mentions Leonard Read’s “anything that’s peaceful” and the non-aggression principle as the basis for libertarianism and yet every chapter begins as a “fight” for or against something. The notion of a “Fight for Peace” is particularly abhorrent and misguided. Libertarianism isn’t a fight, it is a peaceful evolution toward a voluntary society. from Charlottesville, VA Highly recommended! If you are at all interested in an intelligent, concise and extremely well-written overview of libertarianism, I would highly recommend this book. This is the book that you want to have on hand to give to your libertarian-curious friends when they ask you where they should go to learn more. But do keep a copy for yourself---it is a joy to read. Huebert's writing is probably the smartest and most accessible I have ever encountered in a book of this type. Two thumbs up! The first libertarian book of the modern age. A biography and intellectual analysis of some thirty great thinkers.